Bus schedules are explained and distributed at school registrations, and information schedules can be obtained in your child's school office. For specific information on your child’s bus route and bus stop, please contact your area's bus supervisor directly. 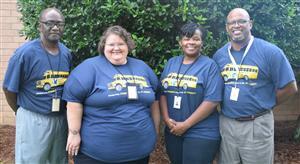 For specific information on your child’s bus route and bus stop, please contact your area's bus supervisor directly. Pictured left to right: John Clinton (Lugoff Area), Vanessa Garza (Elgin Area), Ernestine Ross (North Central Area) and A.J. Cooke (Camden Area). KCSD students in the 2nd grade and younger are not allowed to get off the bus without someone waiting at the bus stop for them; this could be an older sibling or an authorized adult. If no one is waiting for a young child, the school will try to make contact with the family, but if no contact can be made, the student will be brought back to the school. Parents who wish to opt out of this safety procedure should contact the bus office in their area to pick up a form that must be completed and notarized. Who owns and regulates the school buses? The State of South Carolina owns and operates school buses and establishes regulations as to their operation. Under state regulation, school bus transportation is not provided to students who live within 1.5 miles of school. What is a hazard fee? A hazard fee is levied by the state to school districts that choose to provide transportation to students who live within 1.5 miles. The hazard fee is the total amount the school district is charged by the state, based on the state-provided formula. Why does the school district charge a hazard fee to families within the 1.5 mile radius? Prior to the recent severe economic downturn, the school district received some state funding to pay the fees for stops within the 1.5 mile limit that the district believed to be justified. However, this state funding was completely eliminated due to state budget cuts. Because no local funding has been available for this purpose, parents wishing to establish a bus stop within the 1.5 mile limit are asked to pay the hazard fee for the stop. The district makes every effort to keep this fee as low as regulations will allow, allows families to make payments, and helps to arrange for families using the stop to share in the costs.